You may have noticed that the SparkFun design team has been busy churning out all kinds of great graphics that we've used in videos, blog posts and web content. 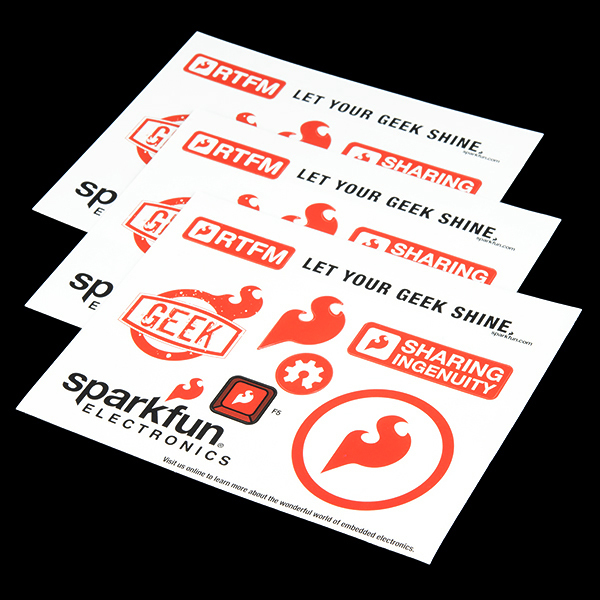 Well now you can stick those sweet graphics to your projects/tools/notebooks with the new and improved SparkFun Sticker Sheet. When leaving soldering iron burns on something is not enough, use these stickers to leave (or cover up) your mark. 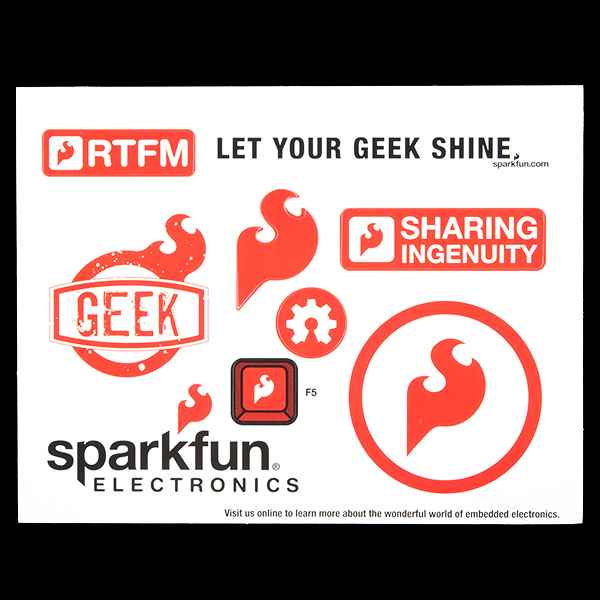 Of course we kept the classic RTFM, but we've also added the According to Pete logo, the flaming F5 key and the OSHW logo. 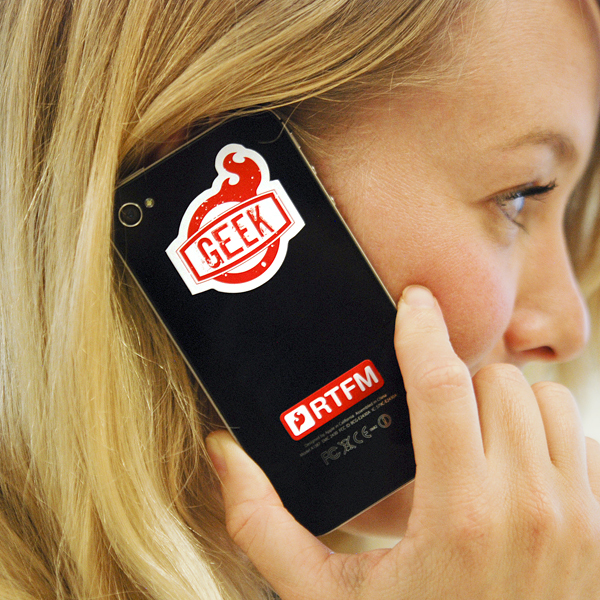 Go slap some stickers and let your geek shine! These should be placed in every box for every order... for free. Stickers are one of the best & cheapest advertising methods. And I don't just mean brand advertising -- I mean these stickers are very good new customer acquisition vehicles. They're highly targeted, have high conversion rates, and you only pay the cost one time but get campaigns that last months or even years. Since many of your customers document their projects with photos or videos, you'll get more than enough impressions to offset the cost. I'd happily rock these stickers all over my gear. But I'm not buying them. We actually do give a way quite a few of these. Basically every time we go places we give out stickers and things, but for those who want more we do sell them fairly cheaply. I still think that it's a great idea to include a sheet with every order. Increases brand loyalty. Is that a transparent type of stickers or in a form of paper stock. Try see this, it is a printing service in San Francisco, and I wanted to request a sticker prints just like yours. stickers - you mean i get to play with stickers!!!! Love them but the cuts should be lined up better. Are the stickers still postcards? No, we have changed the design and they are no longer postcards on the back. Did you like that postcard feature? How can it be used in decorating wall or anything else at home? Is this new?? Just added three to my cart!!! Great for my binders this year!! Can't wait to let that inner geek of mine shine full potential! !